A stunning 50" high definition professional plasma display that delivers the elegance and superb image quality for just about any installation - whether it's in a boardroom, classroom, hotel, or restaurant, while providing full integration in an automated environment. 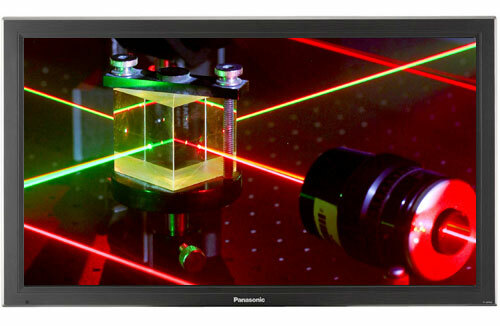 This new 30-Series HD plasma display - the TH-50PH30U, maintains the Panasonic plasma essentials of superior image quality and world-class support. Original image-process technologies have enabled a high contrast ratio of 2,000,000:1. This produces robust blacks that give images even greater realism and depth. Also new to this 720p model is improved video processing providing crisp, clear motion images with a motion picture resolution of 900 lines. When it comes to durability, our panels can be counted on and the TH-50PH30U is no exception. It has an incredibly long expected service life of 100,000 hours, and is backed by a comprehensive 2-year on-site parts and labor limited warranty.